Today's Florence Finds' January Joy prompt is bake some bread. The bread baking in this home is done by the Mr who is currently away. You can see his recipe here. 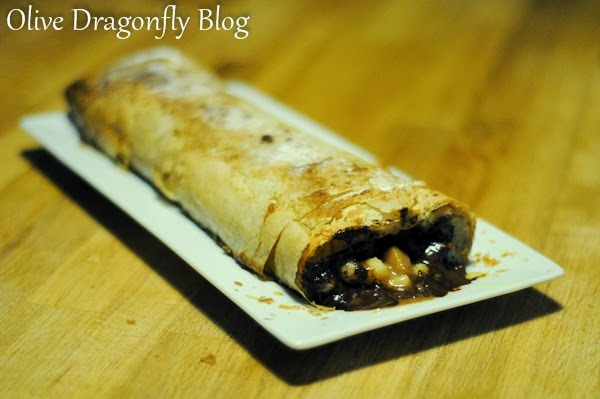 I, however, am the keen sweet baker ;) I promised I'd share this recipe we made for dessert on Christmas day and here it is, the amazing strudel! Recipe (adapted slightly) from BBC Good Food magazine. Melt a knob of butter in a large frying pan, add the pears and 1 tbsp sugar, and cook for 5 mins. Tip into a bowl and leave to cool. Then add the Amaretto, biscuits, cinnamon, chocolate, marzipan, and 2 tbsp sugar and mix well. 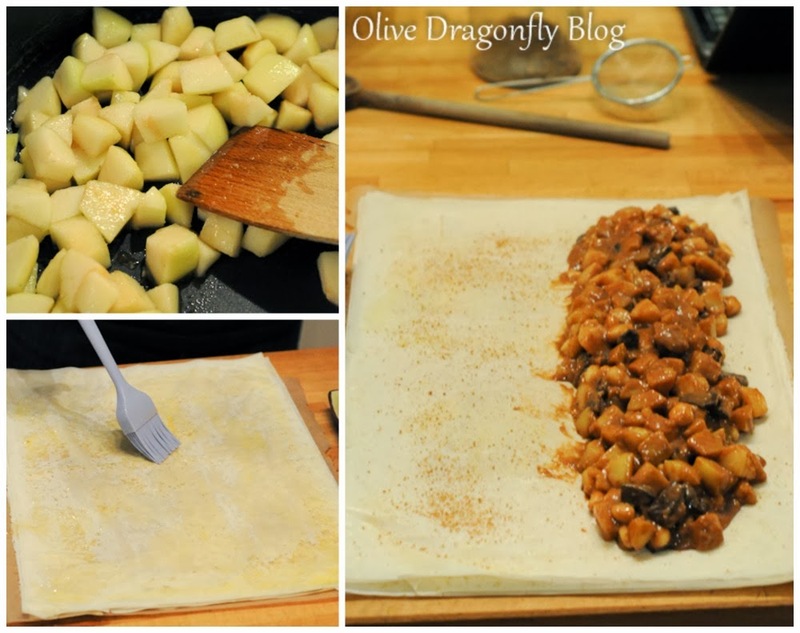 Lay a sheet of filo onto a sheet of baking parchment, brush with melted butter and sprinkle with a little sugar. Top with a second sheet of filo and keep going until you've used all the pastry. Pile the filling down one of the long sides of the pastry, then roll it up to form a sausage. Make sure it's seam-side down, then tuck the ends under tightly. 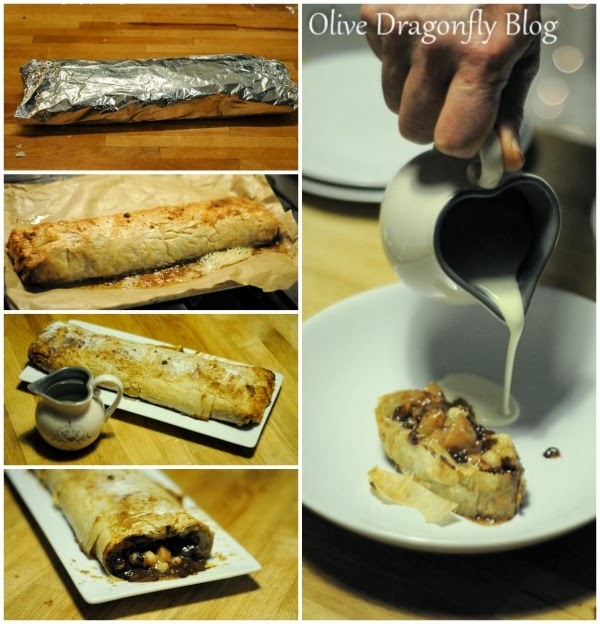 Roll up in the parchment, wrap tightly in foil and freeze. Ours definitely needed to be left in longer - the filling was still quite runny but the marzipan hadn't melted, and although the ends were fine, towards the middle it was still cold and had some solid bits of chocolate remaining. When we re-baked the leftovers the next day, we wrapped individual portions in foil and it came out beautifully, a much thicker filling, all melted, merged and delicious and still crispy on the outside! If making this again I would bake it for at least an hour, ensuring it doesn't burn by covering in foil if the outside starts to become too brown. I'm so glad you posted this, I've been thinking about it since you mentioned it!